May 2nd 2013 was a special day in Soul Clap’s history. After about a year of groundwork the Clap flew the legendary George Clinton to Red Bull Studios in Los Angeles for a three day recording session. Onsite alongside Clinton were P-Funk family Sly Stone, Sa'D "The Hourchild Ali", G-Koop, Tonysha Nelson, Will "Digeridoo" Thoren & Crew Love members Nick Monaco and Navid Izadi. Soul Clap's collaboration with George Clinton has been worthwhile from the two generations of funk. Clinton has included the material on his new Funkadelic album (it’s been 30 years since the last album) including the title track ‘First Ya Gotta Shake The Gate’ and ‘In Da Kar’, which features Sly Stone. 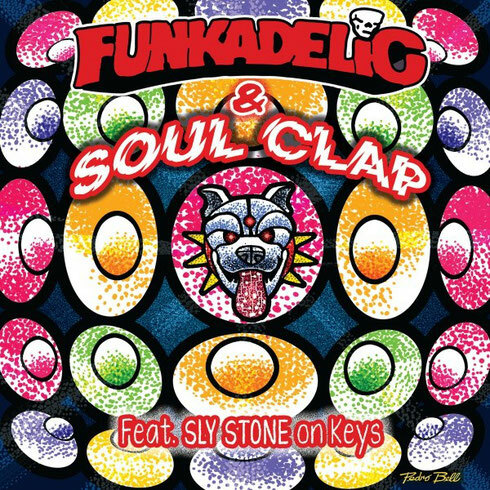 The simultaneous release on Soul Clap Records includes special EFUNK remixes by Soul Clap of ‘First Ya Gotta Shake The Gate’ (aka Samplecopydupeitandloopittostupid) and ‘In Da Kar’. Plus a west-coast, neck-snap, bonus-cut produced with Nick Monaco and with Clinton on vocals, P-Funk engineer G Koop on bass and Crew Love family member Greg Paulus on trumpet, titled ‘Peep This’. When George Clinton’s voice comes on in the club there’s always magic in the air and getting Clinton’s blessing and musical participation has legitimised Soul Clap’s EFUNK movement and opened a new chapter in Soul Clap's sound.